Linda Gehringer, Ariana Venturi and Keira Naughton in I Saw My Neighbor on the Train and I Didn’t Even Smile at Berkshire Theatre Group. Photo by T. Charles Erickson. By Suzanne Heathcote. Directed by Jackson Gay. Composer: Ryan Kattner. Scenic & Lighting Designer: Paul Whitaker. Costume Designer: Jessica Ford. Sound Designer: Broken Chord. Projections Designer: Nicholas Hussong. Producer (New Neighborhood): Jennifer Kiger. Dramaturg: Catherine Sheehy. Assistant Project Designer, Programmer: Dylan Amick. Assistant Costume Designer: Bethany Eddy. Casting Director: Alan Filderman. Stage Manager: Laura Wilson. Pianist: Daniel O’Connell. Cast: Keira Naughton (Rebecca), Linda Gehringer (Daphne), Ariana Venturi (Sadie), Andrew Rothenberg (Jamie), Adam Langdon (Eric) and Adam O’Byrne (Steve). I Saw My Neighbor on the Train and I Didn’t Even Smile is a play about overcoats and what’s under them. Yes, this is one of those dysfunctional-family comedy-dramas that are so prevalent in the theater these days, where extreme characters are placed in extreme situations and have to muddle through with charm and wit and grudges and neuroses. Half of the Yale Repertory Theatre’s last season, and much of the Long Wharf’s, could be said to be in this vein. This play’s format may not be exceptional, but its production is. Suzanne Heathcote’s dialogue is sharp (and sharp-tongued) enough to be entertaining on its own, but she has a real story to tell about a troubled teen’s coming-of-age struggles, and how the alleged grown-ups who must care for her are in no shape to. There’s real form and structure here, with underscoring and foreshadowing and metaphor and a literal frostiness. Young Sadie (given a restless-youth body and world-weary face by Ariana Venturi) has been sent from her California home to live in icy Illinois with her aunt Rebecca (the center of the play, and good thing, because Keira Naughton as Rebecca would steal the show no matter what size the role was) while her Sadie’s father Jamie (Andrew Rothenberg as a most beguiling louse) gets remarried. Incessant insensitive wisecracks are provided by Linda Gehringer as Rebecca & Jamie’s mother Daphne, and friendships are formed with math-student geek Steve (Adam Langdon, drifting into Bruce McCullough Kids in the Hall territory) and online-dating candidate Steve (Adam O’Byrne, who is all too often cast as bad guys but gets at least a moment of warm good-naturedness here before things get weird). The plot heads straight towards what you’re sure are going to be well-worn theater cliches (the interrupted sexual liaison, the physical deterioration of an older character) but veers off into completely different territory. Smart and disarming. Throughout the show, there’s a deft mix of theatricality and reality. This is personified by Keira Naughton, whose character Rebecca is I Saw My Neighbor on the Train and I Didn’t Even Smile’s titular “I.” Naughton has worked with director Gay on both These Paper Bullets! and Sheila Callaghan’s new comedy Elevada. She is masterful at bringing stage presence and a compelling voice to characters that are described onstage as plain, desperate, anxiety ridden and otherwise conventionally unattractive and non-heroic. Yet Naughton always is able to show inner sensitivities, sensualities and senses of humor that may not be outwardly acknowledged yet are essential to the roles she plays. Seriously, someone should do a festival of David Lindsay-Abaire plays and star Keira Naughton in all of them. Ariana Venturi and Keira Naughton. T. Charles Erickson photo. Heathcote gives the cast and designers something deep and well-constructed to work with, and they bring some strong independent and original thought and talent to their assignments. Jackson Gay has been adept at this particular kind of disaffected-youth drama ever since she staged Rolin Jones’ The Intelligent Design of Jenny Chow at Yale Rep and Off Broadway in 2003. She plays out certain moments—coughs, clothes-changing, getting in and out of a car—to such exquisite length that they stop being mere plot points and become performance elements all their own. This dance of life is aided by live between-scene chord-heavy piano pop instrumental riffs composed by Ryan Kattner of the band Man Man and ably banged out by Daniel O’Connell. 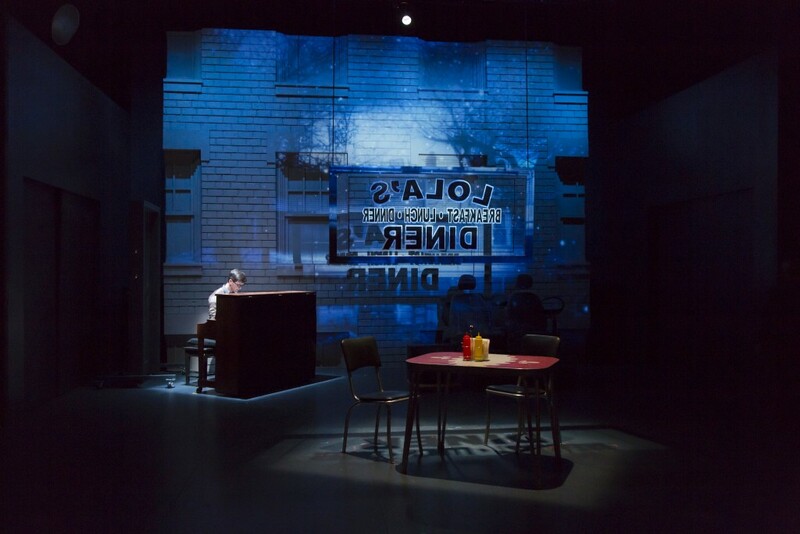 Paul Whitaker’s set and lighting design does the job of shifting to various intense-dialogue-friendly locales (apartment, coffee shop, classroom, car) that scripts such as this require, but ups its environmental ante with crisp projections by Nicholas Hussong. The sound design team Broken Chord provides admirably strident and bonechilling icy-wind effects. Ariana Venturi and Adam O’Byrne in I Saw My Neighbor on the Train and I Didn’t Even Smile. T. Charles Erickson photo. I haven’t gone to the Berkshires to see a show in years, but was really curious about this one. I Saw My Neighbor on the Train and I Didn’t Even Smile is the inaugural production of New Neighborhood, a new theater/TV company made up of a lot of people whose work I’ve admired ever since they were students at the Yale School of Drama. Most of the founding members of the troupe (including I Saw My Neighbor…’s director Jackson Gay, dramaturg Catherine Sheehy, producer Jennifer Kiger, set/lighting designer Paul Whitaker, costume designer Jessica Ford, sound designers Broken Chord and cast members Keira Naughton, Adama O’Byrne and Ariana Venturi) were involved with the hit Yale Rep production of Rolin Jones’ hippy-hippy-Shakespeare wonderment These Paper Bullets! Jones was instrumental in putting New Neighborhood together; for a full list of the company’s nearly three dozen members, go here. How confidently quirky and progressive is New Neighborhood? Enough that it works in established venues in real theater meccas like Stockbridge, L.A. and New York rather than out of some farm in the Northwest. 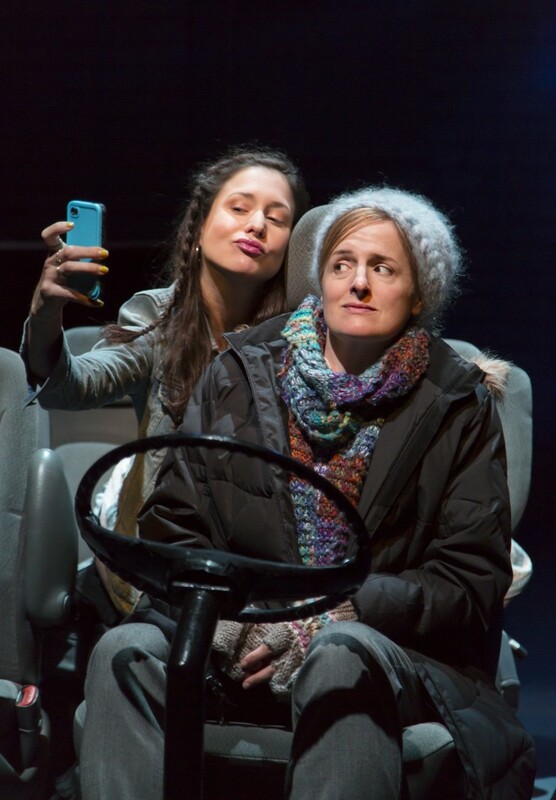 Enough that it enters into co-productions with such institutions as Berkshire Theatre Group, Yale Rep, the Geffen Playhouse and Atlantic Theater Company. Enough that it’s partly funded by the Fox TV network. All without losing its edge. Heck, somehow New Neighborhood has added edge. New Neighborhood’s members are scattered around the country, joining up when a project arises. 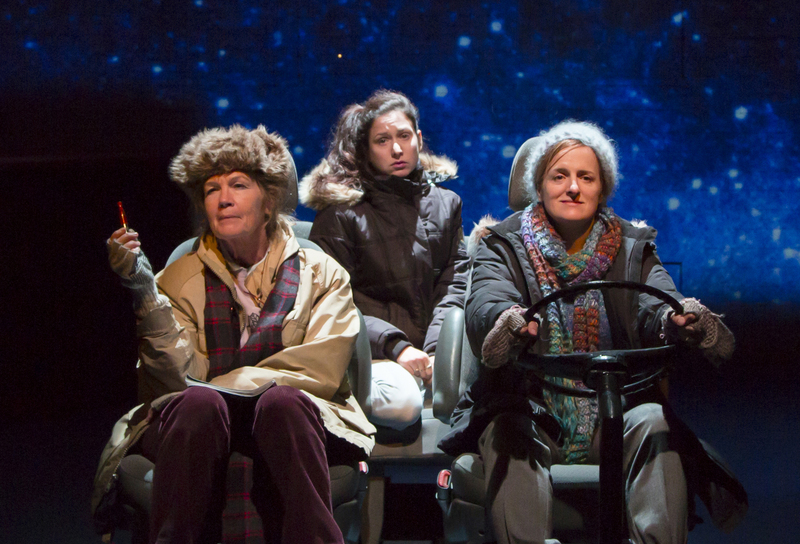 If this theater troupe was a band, it’d be Pavement. It’s an odd way to build an ensemble, but shared up-for-a-challenge sensibilities don’t acknowledge geographical boundaries. I Saw My Neighbor on the Train and I Didn’t Even Smile is a fine, subtle, somewhat laid-back debut for a company that’s about to make a lot of noise when These Paper Bullets! gets restaged in L.A. in September and New York in October. Stockbridge audiences, elderly as they are, appear happy to have I Saw My Neighbor… in their midst, and the show is selling out most of its performances. Very pleased to have witnessed the birth of an audacious collective of contemporary theater artists. 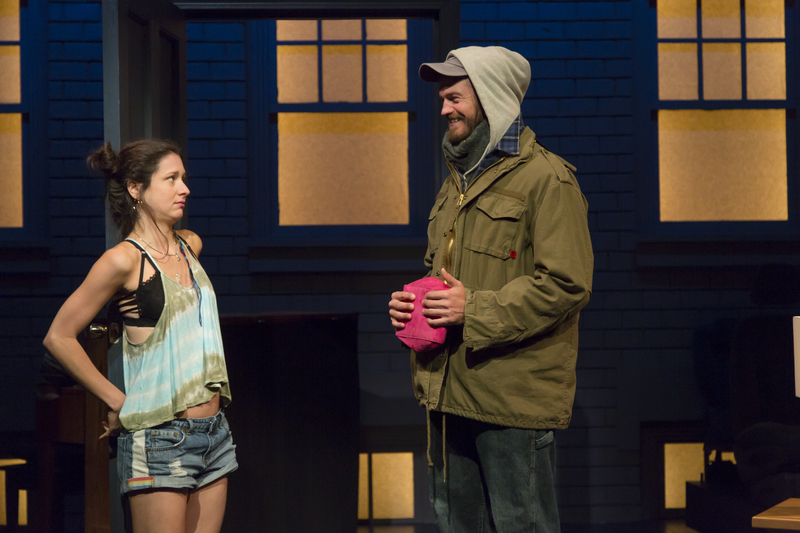 I Saw My Neighbor on the Train and I Didn’t Even Smile, playing at an intimate summer-festival space in Stockbridge and firmly in the mold of modern young disaffected drama, may seem a laid-back, even inauspicious start for this new-formed company. But it’s delirious distinctions are in the details, and this is a fine no-weak-link-anywhere showcase for a dedicated new neighborhood of new-theater insurgents.